Optus understands to keep a strong relationship with their customers they need to be rewarded. That’s why Optus have developed a reward system called ‘yes’ rewards. When you sign up for an Optus Phone and Internet package you’ll receive up to 50 local calls free! That’s a reward of up to $11 every month. This package is great value including: unlimited monthly internet downloads, 22 cent local calls, Optus FreeTime on all your long distance calls, plus be rewarded with ‘yes’ Rewards and get up to 50 free local calls every month. These rewards can be used to make phone calls or dial into the internet. This amazing phone and internet package is only $49.95 a month and comes with all the extras, including line rental. plus 100 bonus internet hours for use in your first month to help you get started – all at no extra charge. And there are no fixed contracts or registration fees. 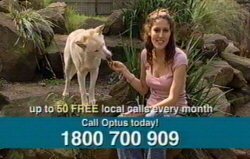 So give Optus a call today and sign up for this great Optus Phone and Internet Package.